Is there a better alternative to Keylord? Is Keylord really the best app in Applications category? Will Keylord work good on macOS 10.13.4? 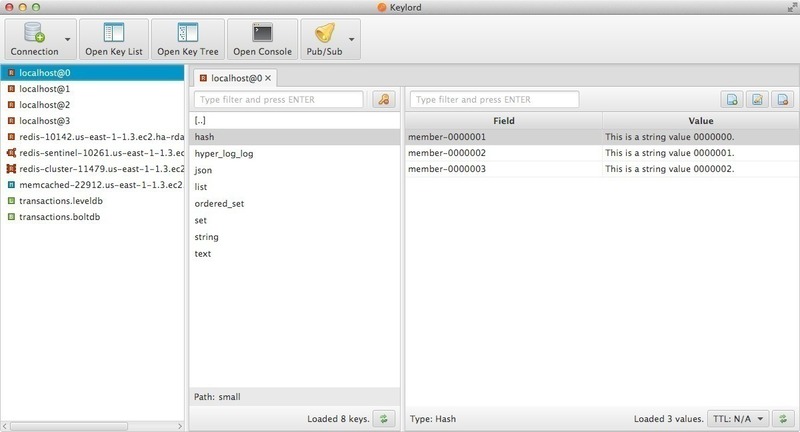 Keylord is a cross-platform application for management of Redis, Memcached, Bolt, and LevelDB key-value databases. It helps establish secure connections over SSH or SSL; to create, edit, and delete keys and values; to receive and send Pub/Sub messages in Redis databases; and many other things. Keylord needs a review. Be the first to review this app and get the discussion started! Keylord needs a rating. Be the first to rate this app and get the discussion started!